Sony's Super Top Emission™ technology has a micro-cavity structure, which incorporates colour filters. The micro-cavity structure uses an optical resonance effect to enhance colour purity and improve light-emission efficiency. In addition, the colour filter of each RGB further enhances the colour purity of emitted light, and reduces ambient light reflection. High-precision signal processing engine has been developed to fulfil the reference monitor criteria and is optimised to maximise OLED panel performance. This engine incorporates 12-bit output accuracy at each process, and provides both a high quality I/P conversion algorithm and a highly accurate colour management system. 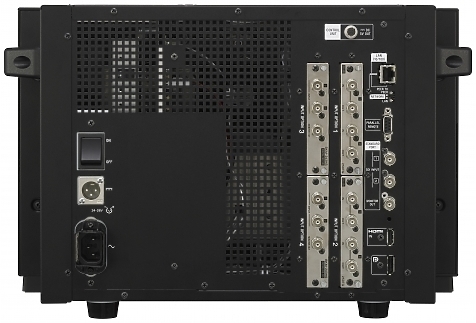 The BVM-E170A monitor can accept almost any SD or HD video format, both analogue and digital and variable computer signals up to 1920 × 1080. In addition to the standard inputs, four option board slots are offered to configure this monitor according to different user needs. This monitor is equipped as standard with two 3G/HD/SD-SDI inputs, an HDMI (with HDCP) input and a Display-Port connector. In addition, four option ports are available to accept analogue or digital input adaptors. By installing the optional BKM-250TG 3G/HD-SDI input adaptor*, the BVM-E170A can support a variety of 3D signal analyses. The 3D signals* are displayed in 2D mode. The BVM-E170A is equipped with a built-in colour sensor, which allows users to calibrate the monitor’s colour temperature (white balance) as needed without an external probe. Calibration performance is minimally affected by ambient light.This function ensures colour and gamma consistency, and reduces user maintenance tasks. The BVM-E170A monitor uses a sophisticated I/P conversion technique that keeps artefacts that are often seen in flat panel displays to a minimum such as edge jaggedness, conversion errors, etc. The BVM-E170A display engine ensures a picture delay that is less than one field. Every BVM-E170A monitor is carefully calibrated at the factory on an individual basis, providing a high level of accuracy and stability for characteristics such as gamma and uniformity. Using a colour feedback system, the BVM-E170A monitor achieves the stability required for broadcast critical monitoring applications. The unique Picture & Picture function of the BVM-E170A allows simultaneous display of two input signals on the monitor’s screen. This function is extremely convenient for making instant adjustments to two input sources. Four modes are available to provide users with enhanced operational flexibility: Side by Side, Wipe, Butterfly, Blending. BVM-E170A master monitor incorporates a Gamut Error Display function that detects irregular signal input. BVM-E170A master monitor incorporates gamma tables to reproduce images captured using S-LOG. S-LOG gamma is a technique used in Sony’s digital cinematography cameras that allows the full latitude of the camera sensor to be maintained throughout the production chain. The 2048 Image Slide function of the BVM-E170A allows 2K resolution (2048 x 1080 pixels) images to be mapped, pixel-to-pixel, on the full-HD (1920 x 1080 pixels) panel without picture degradation. The monitor is equipped with a slide function that allows the display of missing pixels in native mode from the left and right part of the picture. The Scan Switch function allows switching between under scan (-3%), normal scan (0%), and over scan (5%). The Native Scan function is a unique display mode that reproduces images without changing the input signal’s pixel count. The HD Frame Capture function of the BVM Series allows a picture frame from the 3G-SDI and HD-SDI input to be captured and saved as a picture file on a Memory Stick™ media. This picture file can be used as a reference for various purposes, for example, as for picture-tone adjustments between past images and for camera-framing adjustments. A separate control unit BKM-16R is available for the BVM-E170A. It is equipped with a Memory Stick socket enables users to download and save all monitor set-ups such as input channel configuration, control preset adjustments, white balance settings and maintenance parameters. The BVM Series monitors and the BKM-16R Monitor Control Unit are equipped with an Ethernet port, allowing remote control of display parameters across a standard Ethernet connection. One BKM-16R Monitor Control Unit can control up to thirty-two (32) BVM monitors. The BVM-E170A can be DC operated. Due to its lightweight and small-size design, with a comparable height to the former 14-inch BVM-CRT monitors, the BVM-E170A is ideal for field and OB van applications. To facilitate parameter adjustments, the On-Screen Menu indication can be taken off the screen, while in Menu mode. The On-Screen Menu indication can be toggled on or off with a simple press of a button on the BKM-16R’s front panel. The optional BKM-16R control unit includes a Memory Stick slot to save and load monitor configuration and adjustment settings. This is useful for multiple monitor systems, allowing the transfer of one monitor’s setup and adjustment data to another.This data can also be transferred via the BVM’s Ethernet connection. A Chroma UP button located on the front panel of the BKM-16R allows the Chroma level to be boosted by +12dB. This is a convenient feature for adjusting camera white balance with a higher degree of accuracy. BVM Series monitors can display various markers, including an aspect marker, safe area marker and centre marker. In addition to this flexible selection of marker types, detailed display settings of each marker are offered. For example, the colour, brightness, horizontal/vertical position and width of aspect markers can all be controlled, while the height and width of safe area markers can be adjusted. The aspect ratio can be switched between 4:3, 16:9, 2.39: 1 and 1.896:1 depending on the input signal. The user has a wide variety of over 40 functions to choose from. Each of these can be assigned to any of the 16 function buttons (F1 to F16) on the BKM-16R controller. Press ENTER to display the F1 to F8 (or F9 to F16) button assignment on screen. Simply assign STATUS to one of the function buttons (F1 to F16) on the BKM-16R controller. The user can instantly grasp the whole monitor status and configurations without having to search through menus. 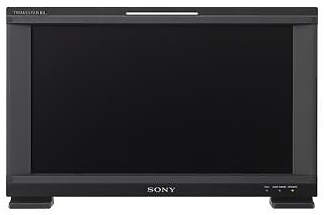 Hire the Sony BVM-E170A 17 inch OLED Reference Monitor from Procam. Best service and rental rates for the Sony BVM-E170A 17 inch OLED Reference Monitor and all cameras, lenses, sound, lighting and grip.